The Grand National is a National Hunt horse race held annually at Aintree Racecourse in Liverpool, England. First run in 1839, it is a handicap steeplechase over 4 miles 514 yards (6.907 km) with horses jumping 30 fences over two laps. It is the most valuable jump race in Europe, with a prize fund of £1 million in 2016. An event that is prominent in British culture, the race is popular amongst many people who do not normally watch or bet on horse racing at other times of the year. Who will win the 2017 Randox Health Grand National? It’s the question everyone is asking, and without the aid of a crystal ball or a time machine we’re all forced to study Grand National odds to help us find the winner. The Grand National betting market is of course the most popular of the year and once again it is looking like the National’s odds is wide open with any number of horses in with a genuine chance. Vieux Lion Rouge is a major contender for David Pipe this season. Favorite backers have found it hard to find Grand National winners in recent years but confidence is growing that Vieux Lion Rouge could become the third market leader to prevail at Aintree in the last decade. The most recent running of the race, in 2016, was won by Rule the World, ridden by jockey David Mullins for trainer Mouse Morris. The next Grand National is on 8 April 2017. 70 horses in all will attempt to navigate the 30-fence, four mile, 514 yard steeplechase course, with the race scheduled to begin at 5:15pm BST/DST on Saturday. List of Grand National 2017 runners and riders: full list of horses and jockeys for Aintree race. The Grand National has been broadcast live on free-to-air terrestrial television in the United Kingdom since 1960. From then until 2012 it was broadcast by the BBC. Between 2013 and 2016 it was shown by Channel 4; the UK broadcasting rights transfer to ITV from 2017. An estimated 500 to 600 million people watch the Grand National in over 140 countries. It has also been broadcast on radio since 1927; BBC Radio held exclusive rights until 2013; however, Talksport also now holds radio commentary rights. 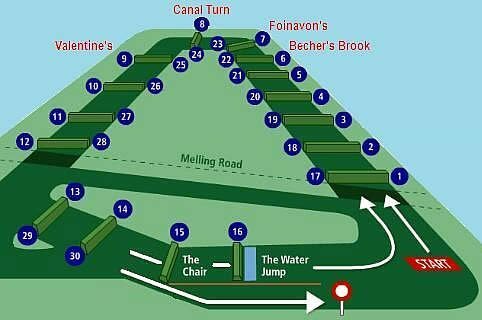 The Grand National is run over the National Course at Aintree and consists of two laps of 16 fences, the first 14 of which are jumped twice. Horses completing the race cover a distance of 4 miles 514 yards (6.907 km), the longest of any National Hunt race in Britain. As part of a review of safety following the 2012 running of the event, from 2013 to 2015 the start was moved 90 yards (82 m) forward away from the crowds and grandstands, reducing the race distance by 110 yards (100 m) from the historical 4 miles 880 yards (7.242 km). The course is also notable for having one of the longest run-ins from the final fence of any steeplechase, at 494 yards (452 m). The Grand National was designed as a cross-country steeplechase when it was first officially run in 1839. The runners started at a lane on the edge of the racecourse and raced away from the course out over open countryside towards the Leeds and Liverpool Canal. The gates, hedges and ditches that they met along the way were flagged to provide them with the obstacles to be jumped along the way with posts and rails erected at the two points where the runners jumped a brook. The runners returned towards the racecourse by running along the edge of the canal before re-entering the course at the opposite end. The runners then ran the length of the racecourse before embarking on a second circuit before finishing in front of the stands. The majority of the race therefore took place not on the actual Aintree Racecourse but instead in the adjoining countryside. That countryside was incorporated into the modern course but commentators still often refer to it as “the country”. The Cheltenham Festival is a meeting in the National Hunt racing calendar in the United Kingdom, with race prize money second only to the Grand National in Aintree. The event brings in more than £20M through ticket sales, hospitality, sponsorship and other income, and there is some £4.3M in prize money on offer, the most of any jump festival in the world. Meanwhile, the four-day event is also estimated to bring in £100M to the wider Gloucestershire economy. The 28-race steeplechase event is run by the Jockey Club and culminates in the Gold Cup day on Friday. The Festival ran from Tuesday, March 14 to Friday, March 17, 2017. 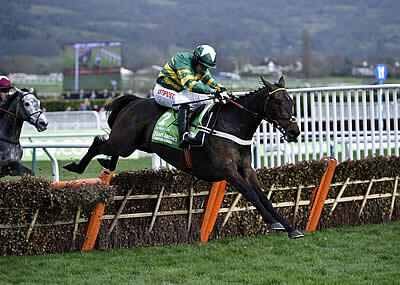 On Tuesday, March 14, Buveur D’Air, ridden by Noel Fehily, won the 2017 Cheltenham Champion Hurdle, the Grade 1 National Hunt hurdle race in Great Britain which is open to horses aged four years or older. “It’s fantastic. To win one was great; to win two is special,” said Fehily, whose first Champion Hurdle win came on Rock On Ruby in 2012. The race is now known as the Stan James Champion Hurdle. It is run on the Old Course at Cheltenham over a distance of about 2 miles and ½ furlong (2 miles and 87 yards, or 3,298 meters), and during its running there are eight hurdles to be jumped. The race is the last leg of the Triple Crown of Hurdling and is scheduled to take place each year on the opening day of the Cheltenham Festival in March. The Champion Hurdle is the most prestigious hurdling event in the National Hunt calendar. Its list of winners features many of the most highly acclaimed hurdlers in the sport’s history, and several of these, such as National Spirit, Istabraq, Hatton’s Grace, Persian War and Lanzarote, have had races named in their honor. Sizing John, ridden by Robbie Power and trained by Jessica Harrington, powered home to win the revered Timico Cheltenham Gold Cup on Friday, March 17. The Timico Gold Cup is one of the most significant Jump races in the season, and nothing can rival the Cheltenham roar as the horses charge up the famous hill. National Hunt racing is the official name given to that form of the sport of horse racing in the United Kingdom, France and Ireland in which the horses are required to jump fences and ditches. 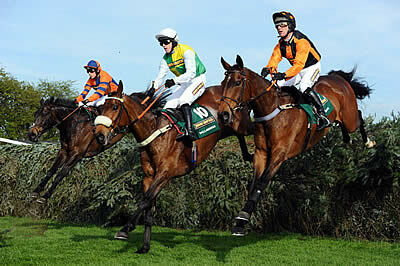 National Hunt racing in the UK is divided into two major distinct branches: hurdles and steeplechases. Alongside these there are “bumpers”, which are National Hunt flat races. In a hurdles race, the horses jump over obstacles called hurdles; in a steeplechase the horses jump over a variety of obstacles that can include plain fences, water jump or an open ditch. In the UK the biggest National Hunt events of the year are generally considered to be the Grand National at Aintree and the Cheltenham Gold Cup. Jump racing is most popular in Britain, Ireland and France. In Ireland the sport receives much higher attendances than flat racing, while in England it is more balanced, but the different seasons (there is little top-class flat racing in Britain from November through March) mean that most fans of the sport can enjoy both forms of racing. The Grande Course de Haies d’Auteuil, sometimes referred to as the French Champion Hurdle, is a Group 1 hurdle race in France which is open to horses aged five years or older. It is run at Auteuil over a distance of 5,100 meters (about 3 miles and 1½ furlongs) on Sundays at the Galop, March 26, 2017. The NAAS Kilcock Novice Chase is a Grade 3 National Hunt novice chase in Ireland which is open to horses aged five years or older. It is run over a distance of 2 miles and 4 furlongs (4,023 meters) and during the race there are 13 fences to be jumped. It is scheduled to take place March 26, 2017. National Hunt horses are often bred for jumping, while others are former flat horses. National Hunt horses do not have to be Thoroughbreds: many French-bred jumpers are Selle Français or AQPS. Many horses begin their racing careers in amateur Point-to-Pointing where they compete over steeplechase races of 3 miles. The two main highlights of the National Hunt calendar are the Cheltenham Festival meeting and the Grand National meeting. The Cheltenham Festival is held at Cheltenham Racecourse over four days in the second week of March. It features eleven grade one races, culminating in the Cheltenham Gold Cup, the best and most prestigious Chase race in the world, on the Friday. The Grand National meeting, held at Aintree over three days every April, is the next major racing event to be held. Many of the best horses come to these festivals, which are watched by a huge television audience worldwide. Hundreds of millions of pounds are gambled on these festivals.